Perfect weather, smiling moon, land of smiles? Where to start? OK, let's start with the weather in Phuket. Still breezy, but otherwise what you might call perfect. Perhaps a tad hazy, but blue skies and warm days so far this week. The Northeast winds do set in quite strong sometimes. I remember in November 1999 when I arrived in Phuket the people were saying it was unusually windy for the time of year. Same this year. You can check winds on Windguru or on the live Phuket Weather station. Today's weather - perfect. Hoping tomorrow will be the same as I ought to take a few photos! But this morning rushed a bit to drop my son at school, then go to Phuket Immigration for my 90 day check in, and get to work on time to see how many customers would be pi**ed off today about flights and lack of refunds. 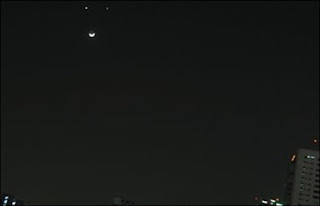 The Smiling Moon was apparently visible all over the world... the relative positions of moon and planets changing depending where you stood on our planet. If I had been an Inca, a Maya or an ancient Egyptian, this would surely have been a sign. I've nicked some pics off the web - these were taken in Bangkok. The top photo is from a blogger who says this is surely "a beautiful sign that things are going to get better, much better". Amen. The bottom photo is from the BBC website which has a bunch of smiling moon photos from round the world. I hope the signs are being read by Thailand's elite. Today, the constitutional court ruled that the ruling coalition is illegal and .. finally looks like those PAD tossers are going to stop their stupid protests and get on with life. Somewhere along the line, these different groups will need to compromise. For now, let us hope for some political stability, some common sense.. and can I just say that if Abhisit becomes PM, I'd be very happy with that. And if anyone who leads the "PAD" is elected I will not be happy. Latest reports say that flights into Bangkok could start in a couple of days. Updated commentary - Bangkok Pundit - a very good blog for getting an idea of the politics and history behind all this. Back to the weather. I think I can finally say we are in real high season weather, sun is shining, moon is smiling, I hope things will work out, I hope people are not too angry about this situation I hope. I hope.